NEW YORK (TheStreet) -- If you haven't already heard, buy and hold is alive and well. Reports of its death have been greatly exaggerated once again. 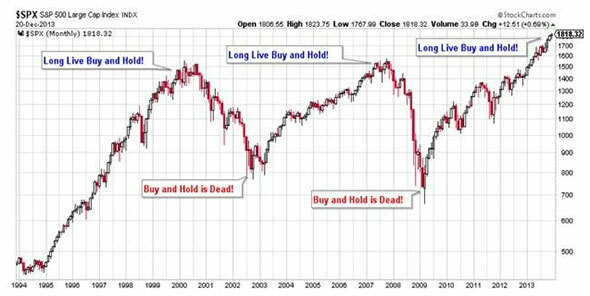 In the closing days of 2008, buy-and-hold was declared dead, as it is near the end of every bear market. For the second time in less than a decade, U.S. equity investors had lost over half of their value and the S&P 500 (SPY - Get Report) closed out the year below its level from 10 years earlier. At the time, of course, the hottest investment products were anything related to active risk management, tactical trading, or preservation of capital. You couldn't give away a constant beta fund that mimicked the S&P 500. You would've been laughed out of a room full of institutional investors. The popular saying at the time among investment managers and financial advisers was, "It's not about return on capital, it's about return of capital." As we close out 2013, a very different story is being written. With a gain of close to 30% on the year, the S&P 500 is on pace for its best year since 1997. At the same time, it has been one of the smoothest rides higher of any year in history, with no pullback to the 200-day moving average (first time since 1995) and the highest percentage of up days since 1995. The hottest investment products of today are anything related to long-only and passive U.S. equities. Recent mutual fund data released by Morningstar illustrate this trend in dramatic fashion. The data showed that Vanguard Group, best known for its passive index funds, pulled in $41.4 billion into its U.S. equity funds this year. This is not all that surprising -- but what is surprising is that this total represented 98% of the total net inflows to U.S. equity funds this year. It is not difficult to understand why after looking at performance over the past five years. As it stands today, the S&P 500 is up over 173% from its March 2009 low. Anything with less-than-constant exposure to the U.S. equity market is, of course, significantly trailing this return, which includes active strategies, alternative strategies and all other asset classes. Hedging and risk management have become four letter words as the ghost of corrections past has faded from the memories of investors. At a recent meeting, an investor asked me why he should hedge at all if the market only goes up, saying, "It's just throwing money away." When you step back and think about it, of course, this is the opposite of what investors should be thinking after a 173% runup. As the long-term chart of the S&P 500 below demonstrates, the ideal time for investors to be considering an active investment strategy that incorporates risk management is after a long period of smooth, upward returns that leaves the index on the higher end of the valuation spectrum. This is when investors have been at greatest risk of loss in the past and an active risk management strategy could add the most value to their portfolio. Unfortunately, most investors are inclined to do the exact opposite. They only start thinking about active risk management at the end of a bear market after they have already incurred a large drawdown. But by the time the media is talking about a recession, it is often too late. At that point, investors should actually be moving in the other direction, seeking out more exposure to constant beta strategies as valuations are favorable and risk of permanent loss is diminished. As we close out 2013, it has certainly been a remarkable year for U.S. equities and a remarkable five-year run from the end of 2008. While tempting to assume the next five years will bring similar gains, the intelligent investor will be considering the possibility that the future may look different. If this is indeed the case, the time to protect against a risk of loss in the future is not when buy-and-hold is dead, but when buy-and-hold is alive and well.